As FAIR has noted before, centrist and liberal media have a disturbing tendency to rehabilitate some of the most vile, reactionary forces on the American right simply because they say vaguely negative things about Donald Trump — a phenomenon we call “Trumpwashing.” In the understandable service of shoring up forces against a destructive president, producers and editors check their memories at the door and help rebrand a laundry list of war criminals, anti-LGBTQ weirdos and Islamophobic media hustlers simply because they also happen to not like Trump. 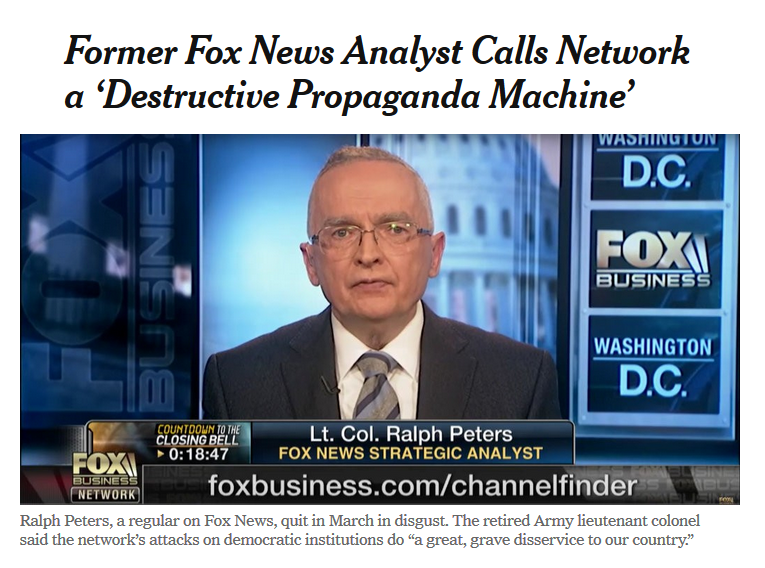 The latest version of this terrible trend is the recent veneration of retired Lt. Col. Ralph Peters. 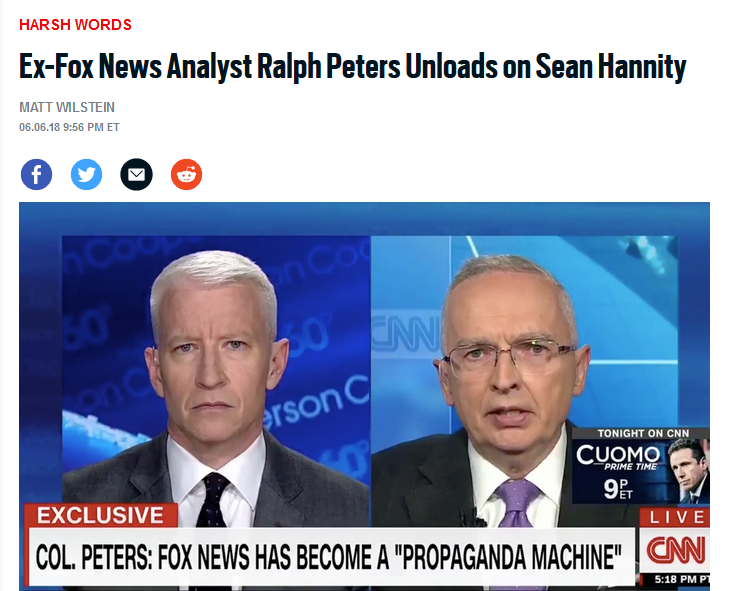 A long-time Fox News presence, Peters quit the network in March to much fanfare, calling it a “propaganda machine” in service of Trump. But Peters is a strange arbiter of what is and isn’t propaganda, given his long history of bigoted, warmongering vitriol. 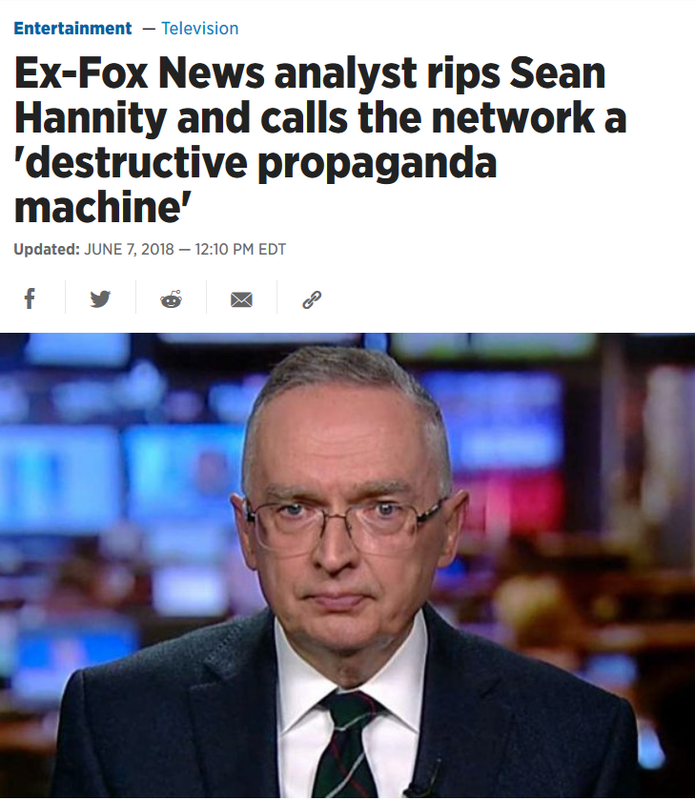 From insisting Islam “is not a religion of peace,” to constantly suggesting Black Lives Matter and Obama were Islamists, to calling Yemenis “primitive,” to writing a 2002 op-ed in the Wall Street Journal headlined “Civilian Casualties: No Apology Needed,” Peters has been one of the most bloodthirsty hawks and overtly anti-Muslim trolls in American media. He even lobbied for one of the very things he criticizes Putin for doing, the killing of journalists — calling for “military attacks on the partisan media” in the Journal of International Security Affairs. For years, I was glad to be associated with Fox. It was a legitimate conservative and libertarian outlet. And a necessary one. But with the rise of Donald Trump, Fox did become a destructive propaganda machine. And I don’t do propaganda for anyone. So when Fox News was inciting against immigrants, trafficking in anti-Muslim bias, defaming the poor and smearing Black Lives Matter, he was fine with this, it was “necessary,” but now that it’s doing all these things plus boosting Trump, it’s somehow crossed a line? OK.
As FAIR’s Jeff Cohen noted in March, Trumpwashing is a problem that plagues ostensibly liberal MSNBC as well. The network has become something of a dumping ground for the worst elements of the American right wing, from spooks to ex-military brass to Bush-era war propagandists. One would say the only criteria to get on MSNBC is to be anti-Trump, but this would mean the network would have to make room for leftists and Bernie Sanders partisans who also hate Trump. The producers at 30 Rock, mysteriously, can’t find time for this increasingly large cohort. “But liberals need all the help they can get,” one might argue. Perhaps, but certainly there are limits to this? If, say, white nationalist Richard Spencer for some reason decided Trump was bad on foreign policy and denounced him, we can all agree he shouldn’t be invited on CNN and get dozens of lofty write-ups praising his courage? Obviously, Peters isn’t a neo-Nazi, and these questions are always a matter of degree, but shouldn’t the line be drawn well before “anti-Muslim warmonger who once took time out to advocate why we should be open to killing journalists”? If the liberal embrace of documented racist Glenn Beck, who then went on to be pro-Trump anyway, is any guide, there’s a cost to legitimizing every far-right loudmouth solely because they say mean things about the president. The primary difference between a Trump conservative and a #NeverTrump conservative is that the latter happens to like the CIA slightly more than they hate poor people. Being good on exactly one thing — hating Trump — and in the most belated, surface-level manner possible, does not erase a hateful, racist ideology that animated one’s entire career. Cable news producers should factor that in when turning the fringes of the right into #Resistance heroes simply because they check off one partisan box. Or, at the very least, if they’re going to have them on, they should spell out their guests’ long track record of hate, incitement and racism. Author and commentator joins Salon's Amanda Marcotte to discuss today's climate of hate, bullying and trolling.